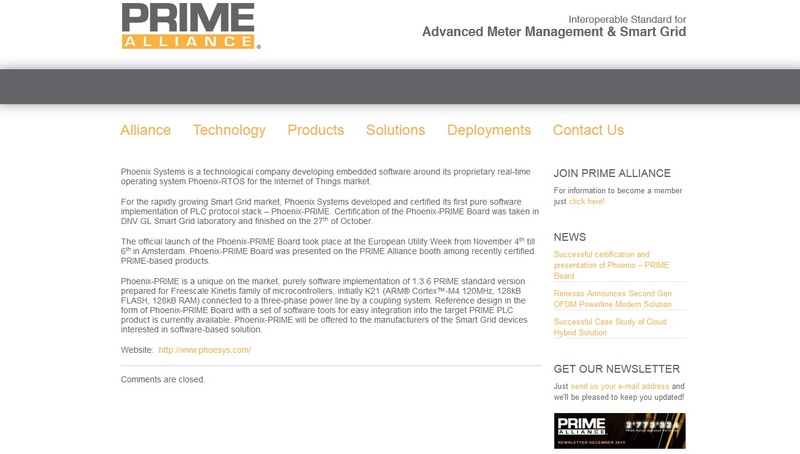 iSMART, the intelligent gas meter operating under control of Phoenix-RTOS operating system, has passed the tests of compliance with the requirements of the SMART-GAS protocol, as the first gas meter in Poland! Developed by the Polish company Apator Metrix, in cooperation with Phoenix Systems, the gas meter is an innovative IoT measuring device and one of the first devices for the emerging smart gas networks market. The device is now in the scope of interest of clients from Poland, Italy, Lithuania, Ukraine and Belgium. The gas meter can be produced in various functional configurations. Thanks to Phoenix-RTOS it is possible to use a wide range of network stacks (e.g. WM-BUS, ZigBee) and communication protocols (e.g. SMART-GAS, DLMS / COSEM). The device has an electronic counter, is equipped with temperature correction, a gas flow shutoff valve and a communication module. It meets all CE conformity requirements, including MID, ATEX, EMC and RED. The measurement of gas volume and flow is carried out by dedicated metrological software and the separate software module is responsible for the logic of collecting measurement data and making it available to external systems. 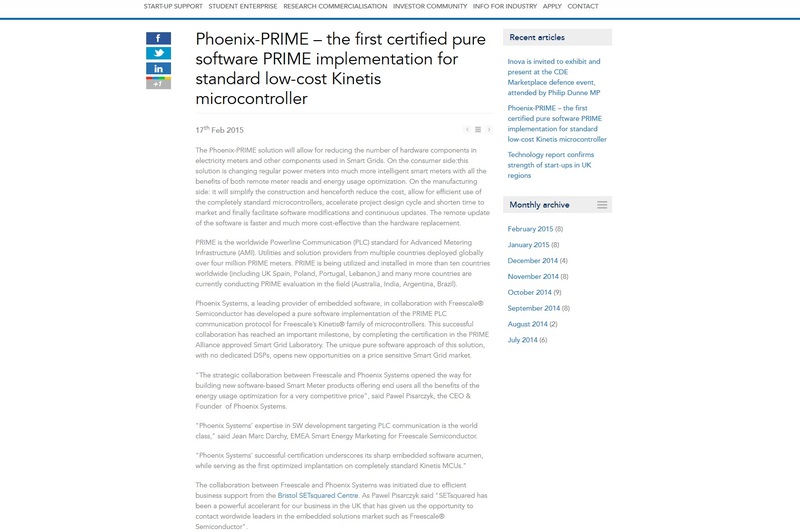 All software runs under the control of the Phoenix-RTOS real-time operating system. Yesterday, during the first day of the 11th TIME Economic Forum - 5G Networks for industry 4.0 Paweł Pisarczyk appeared in the panel on Artificial Intelligence in industry - opportunities and challenges. The culmination of the first day of the Forum was the ceremonial Gala, during which the 11th Economic Forum TIME Awards were presented! In the category of the Polish Company of the Year ICT, the Syneris company received the award for the implementation of an innovative educational program based on artificial intelligence, and the awards in this category were received by the following companies: Atende Software and INEA. We are pleased to announce that we have received funding for the project in the field of security and defense of the state called CyberCrypt@GOV. The project will be implemented over a period of 48 months, in a consortium of AGH University of Science and Technology, Warsaw University of Technology and the Academy of War Art. The co-financing will amount to PLN 12.4 million. The subject of the project will be the acquisition and development of technology necessary to create a distributed, scalable, high-performance system for breaking cryptographic security. The solution is part of the priority technology area called "Forensic technique, modern technologies or innovative solutions in the sphere of teleinformatic security, information security in teleinformatic systems and networks, and national cryptography". We present the operating system for Internet of Things along with devices in which it operates, on the largest trade fairs for the energy sector in Europe. EUW is the leading event showcasing expert knowledge, innovative solutions and foresight from hundreds of industry leaders, coherent with European strategy to achieve a smooth transition towards a low carbon energy supply. Pawel Pisarczyk was invited to the Huawei Faculty Summit, taking place on 30 October. The summit will be focused on IoT. During the workshop, several Huawei research groups will give overviews of their research objectives to help facilitate collaboration discussion. Additional Huawei researchers and faculty from select schools will also be in attendance. Pawel Pisarczyk will give an opening lecture entitled „Phoenix-RTOS - the microkernel-based operating system for IoT”. He will talk about the development of the system, which he began with his master's thesis, and the reasons why now it is one of the systems positioned as ideal for the Internet of Things. Huawei is a leading global information and communications technology (ICT) solutions provider with operations in over 150 countries. Currently, it has over 150,000 employees with approximately 70,000 engaged in Research & Development. Huawei operates a global network of 14 regional headquarters, 16 R&D Centers, and 28 Innovation Centers. Pawel Pisarczyk, Atende Software CEO was invited by JETRO to participate in the "Business delegation to Japan in the IoT sector of companies from Central and Eastern Europe". The delegation takes place on October 14-20, 2018, on the occasion of CEATEC JAPAN 2018, which is the largest IoT trade fair in Japan. The mission will include study trips, business seminars, networking conference and face-to-face meetings with specialists and potential partners. During the meetings Pawel Pisarczyk will present Phoenix-RTOS- operating system for IoT, besmart.energy technology based on AI, acting as an intelligent energy assistant, as well as redGuardian - a system for mitigating DDoS attacks. JETRO, or Japan External Trade Organization, is an organization associated with the government, working to promote mutual trade and investment between Japan and the rest of the world. We are happy that our technology is noticed and enjoys a growing interest in the world. The National Educational Network (OSE) is a fast, safe and free Internet in every school. Almost 800 schools from all over Poland take part in the project. The OSE project was created thanks to the Ministry of Digitization and is operated by NASK the National Research Institute. As part of the project, NASK announced a tender to protect the OSE infrastructure against DDoS attacks. The tender was won by Atende Software, offering the proprietary redGuardian system. The system met all the requirements of the ordering party - in particular in terms of capacity (35 Gbps of filtered traffic), lists of mitigated attacks, time of activation and deactivation of protection as well as mechanisms for detecting attacks and traffic anomalies. The contract value will amount to 506 K PLN, and its term of validity is to be no longer than 6 months from the date of service implementation. redGuardian is a carrier-grade, software-defined DDoS mitigation platform, developed by Atende Software, ready to handle fast moving, terabit scale attacks. redGuardian provides a first layer of network security and allows to inspect and filter 100M+ packets per second on a single node. To date, such a performance level was achievable on FPGA and ASIC-based platforms only.